Great Danes are so misunderstood. SO many people are under the wrong impression when it comes to who a Dane is and what type of pet they can be. For example, they think they require a lot of space just because they are big. Here is an article I found that tackle some of the most best Great Dane facts: 10 Surprising Facts About the Great Dane. I’m sharing 5 of the facts I liked the most here. Go to his page to see all 10! They really don’t eat that much. A full grown Great Dane eats about 2-3 cups of dry dog food in a meal. Too much protein should be avoided, particularly with puppies, as growing faster than they already do can damage bones and joints. Rather than the high-protein, quick-grow type puppy foods, they should have an adult food with no more than 23 percent protein. Apartment life is just fine for Great Danes. 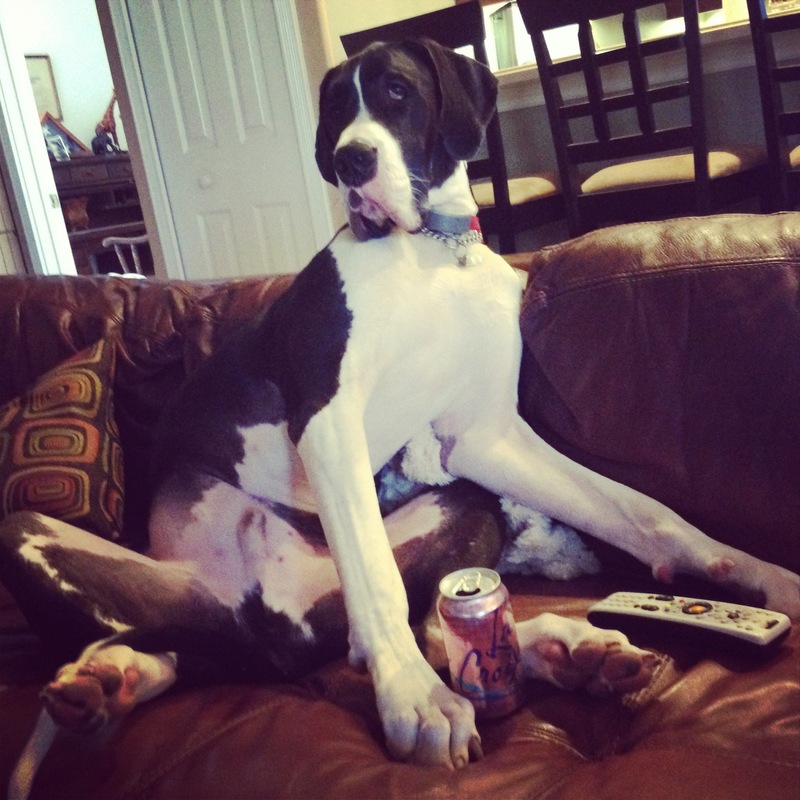 Despite their size, according to the AKC, life in an apartment can suit a Great Dane quite well. They are not as high energy as other breeds, but despite their couch potato ways, daily exercise is important. A brisk half hour walk a day will do, especially if complemented with some run time at a dog park or secure area a few times a week. No fenced area? A 50-foot training leash and a ball can help your Dane keep fit. Great Danes grow incredibly fast. Within a span of just 1 year, Great Danes go from just a handful of fluffy puppy to being able to stand up on their hind legs and look a 6-foot tall man eye-to-eye. During their rapid growth spurts, puppies can be visibly bigger after a night’s sleep. Great Danes can be remarkably gentle. That is, once the period of rapid growth passes and they gain full control of their body, bringing an end to accidental injuries due to clumsiness. Many Danes share their homes with small dogs and cats. Great Danes have a well-deserved reputation for being wonderful with children and sometimes work as therapy dogs. However, no animal should be fully trusted with young children, especially one of such a size that a single mistake could be tragic. They tend to be a lady’s dog. That’s only because of the difference in speech and mannerisms between men and women, however. Great Danes do not respond well to hard correction or training methods, as they are emotionally sensitive creatures.